WASHINGTON, June 25, 2015 /PRNewswire-USNewswire/ -- Millennials, or America's youth born between 1982 and 2000, now number 83.1 million and represent more than one quarter of the nation's population. Their size exceeds that of the 75.4 million baby boomers, according to new U.S. Census Bureau estimates released today. Overall, millennials are more diverse than the generations that preceded them, with 44.2 percent being part of a minority race or ethnic group (that is, a group other than non-Hispanic, single-race white). Five states or equivalents were majority-minority: Hawaii (77.0 percent), the District of Columbia (64.2 percent), California (61.5 percent), New Mexico (61.1 percent) and Texas (56.5 percent). Among the remaining states, Nevada is the closest to crossing this threshold, with a population 48.5 percent minority. 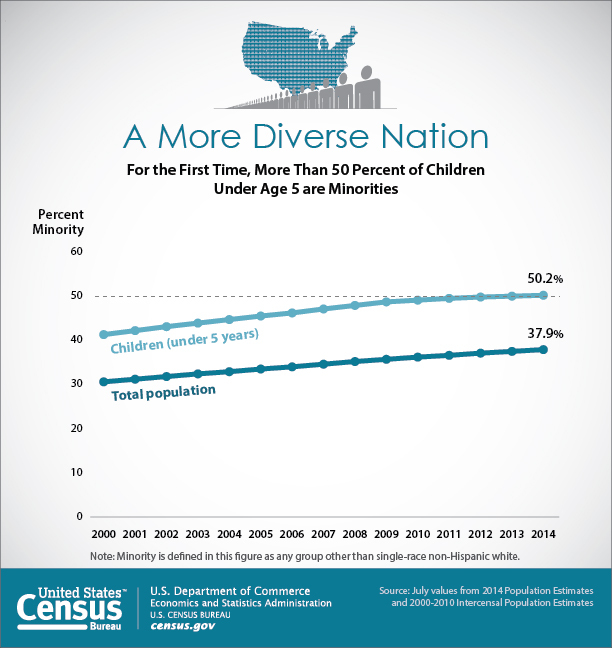 More than 11 percent (364) of the nation's 3,142 counties were majority-minority in 2014. Five reached this milestone during the year beginning July 1, 2013: Russell, Ala.; Newton, Ga.; Eddy, N.M.; Brazoria, Texas; and Suffolk city, Va. The nation's 65-and-older population grew from 44.7 million in 2013 to 46.2 million in 2014. This group, which now contains the oldest four years of the baby boom generation (born between 1946 and 1964), is 21.7 percent minority, less diverse than younger age groups. Between 2010 and 2014, the only two counties to add more than 100,000 people 65 and older to their total populations were Los Angeles, Calif. (167,000) and Maricopa, Ariz. (103,000). San Juan, Colo., had the highest rate of increase in the 65-and-older population of any county between 2010 and 2014 (70.9 percent). Two other Colorado counties (San Miguel and Douglas) were also in the top five. Florida had the highest percentage of its population age 65 and older among states in 2014 (19.1 percent), followed by Maine (18.3 percent). Alaska had the lowest percentage (9.4 percent), followed by Utah (10.0 percent). Sumter, Fla., was the nation's only majority 65-and-older population county in 2014 (52.9 percent). Chattahoochee, Ga., had the lowest percentage of its population in this age group (4.1 percent). In contrast to most states, five experienced a decline in median age between July 1, 2013, and July 1, 2014: North Dakota, Hawaii, Montana, Wyoming and Iowa. Median age declined in 434 counties over the period, with McKenzie, N.D., leading the way (32.9 to 31.6). Maine experienced the largest increase in median age among states, rising from 43.9 to 44.2 over the period. St. Helena, La., experienced the largest rise in median age among counties or equivalents, climbing from 40.2 to 41.3. There was a greater than 13-year difference between the state with the highest median age (Maine at 44.2) and that with the lowest (Utah at 30.5). There was a more than 42-year difference between the county with the highest median age (Sumter, Fla., at 65.9) and that with the youngest (Madison, Idaho, at 23.1). There were 74 counties where the median age was greater than 50, and 57 counties where it was less than 30. There were only 10 states where males made up a majority of the population in 2014. Alaska had the highest male percentage (52.6 percent), followed by North Dakota (51.3 percent). The District of Columbia had the highest percentage of females of any state or equivalent (52.6 percent), followed by Delaware (51.6 percent). All race and ethnic groups except single-race, non-Hispanic whites had more births than deaths between 2013 and 2014. This group had 61,841 more deaths than births. The nation's Hispanic population totaled 55.4 million as of July 1, 2014, up by 1.2 million, or 2.1 percent, since July 1, 2013. California had the largest Hispanic population of any state in 2014 (15.0 million). However, Texas had the largest numeric increase within the Hispanic population since July 1, 2013 (228,000). New Mexico had the highest percentage of Hispanics at 47.7 percent. Los Angeles had the largest Hispanic population of any county (4.9 million) in 2014 while Harris, Texas, had the largest numeric increase since 2013 (45,000). Starr ? on the Mexican border in Texas ? had the highest share of Hispanics (95.8 percent). The nation's black or African-American population totaled 45.7 million as of July 1, 2014, up by 578,000, or 1.3 percent, since July 1, 2013. The nation's Asian population totaled 20.3 million as of July 1, 2014, up by 631,000, or 3.2 percent, since July 1, 2013. California had both the largest Asian population of any state (6.3 million) in July 2014 and the largest numeric increase of Asians since July 1, 2013 (162,000). Hawaii was the nation's only majority-Asian state, with people of this group comprising 56.2 percent of the total population. Los Angeles had the largest Asian population of any county (1.7 million) in 2014 and the largest numeric increase (29,000) since 2013. Honolulu and Kauai, both in Hawaii, were the nation's only majority-Asian counties. The nation's American Indian and Alaska Native population totaled 6.5 million as of July 1, 2014, up by 93,000, or 1.4 percent, since July 1, 2013. California had the largest American Indian and Alaska Native population of any state in 2014 (1.1 million) and the largest numeric increase since 2013 (13,000). Alaska had the highest percentage (19.4 percent). Los Angeles had the largest American Indian and Alaska Native population of any county in 2014 (235,000), and Maricopa, Ariz., the largest numeric increase (4,700) since 2013. Shannon, S.D. ? on the Nebraska border and located entirely within the Pine Ridge Indian Reservation ? had the highest percentage (93.4 percent). The nation's Native Hawaiian and Other Pacific Islander population totaled 1.5 million as of July 1, 2014, up by 33,000, or 2.3 percent, since July 1, 2013. Hawaii had the largest population of Native Hawaiians and Other Pacific Islanders of any state (370,000) in 2014 and the highest percentage (26.0 percent). California had the largest numeric increase since 2013 (7,000). Honolulu had the largest population of Native Hawaiians and Other Pacific Islanders of any county (239,000) in 2014, and Hawaii County had the highest percentage (34.4 percent). Clark, Nev., had the largest numeric increase since 2013 (1,100). The nation's non-Hispanic white alone population totaled 197.9 million in 2014, up by 94,000, or 0.5 percent, since 2013. California had the largest non-Hispanic white alone population of any state in 2014 (14.9 million). Texas had the largest numeric increase in this population group since 2013 (79,000). Maine had the highest percentage of the non-Hispanic white alone population (93.8 percent). Los Angeles had the largest non-Hispanic white alone population of any county (2.7 million) in 2014. Maricopa, Ariz., had the largest numeric increase in this population since 2013 (23,000). Leslie, Ky., comprised the highest percentage (98.1 percent) of single-race non-Hispanic whites. Unless otherwise specified, the statistics refer to the population who reported a race alone or in combination with one or more races. Censuses and surveys permit respondents to select more than one race; consequently, people may be one race or a combination of races. The detailed tables show statistics for the resident population by "race alone" and "race alone or in combination." The sum of the populations for the five "race alone or in combination" groups adds to more than the total population because individuals may report more than one race. All references to age, race, and Hispanic origin characteristics of counties apply only to counties with a 2014 population of 10,000 or more. The federal government treats Hispanic origin and race as separate and distinct concepts. In surveys and censuses, separate questions are asked on Hispanic origin and race. The question on Hispanic origin asks respondents if they are of Hispanic, Latino, or Spanish origin. Starting with the 2000 Census, the question on race asked respondents to report the race or races they consider themselves to be. Hispanics may be of any race. Responses of "some other race" from the 2010 Census are modified in these estimates. This results in differences between the population for specific race categories for the modified 2010 Census population versus those in the 2010 Census data.